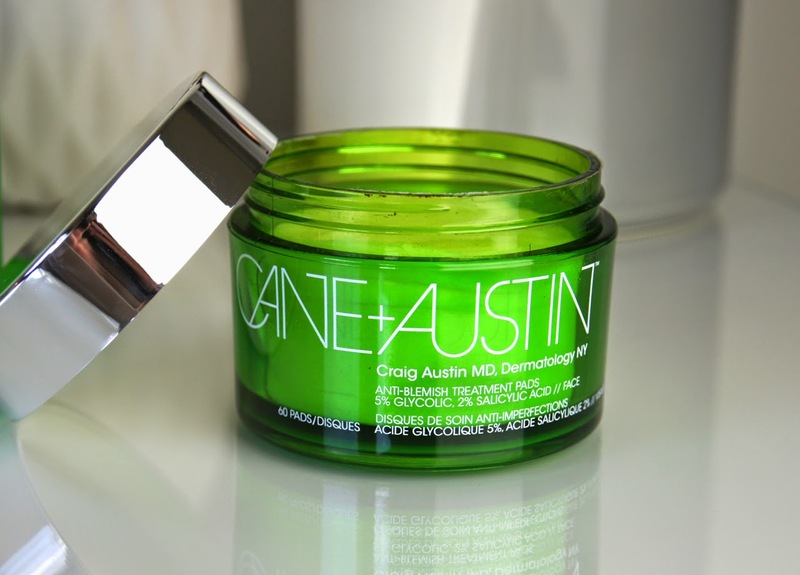 When I first saw the Acne Treatment Pads from Cane + Austin, I was sceptical. After hearing the Origins Spot Remover blemish treatment pads weren't that great, I assumed that these would be similar. After deliberating for a week or so, I decided to give them a chance and I couldn't have been more surprised with them. When my skin is acting up, I have been using these as part of my morning routine. 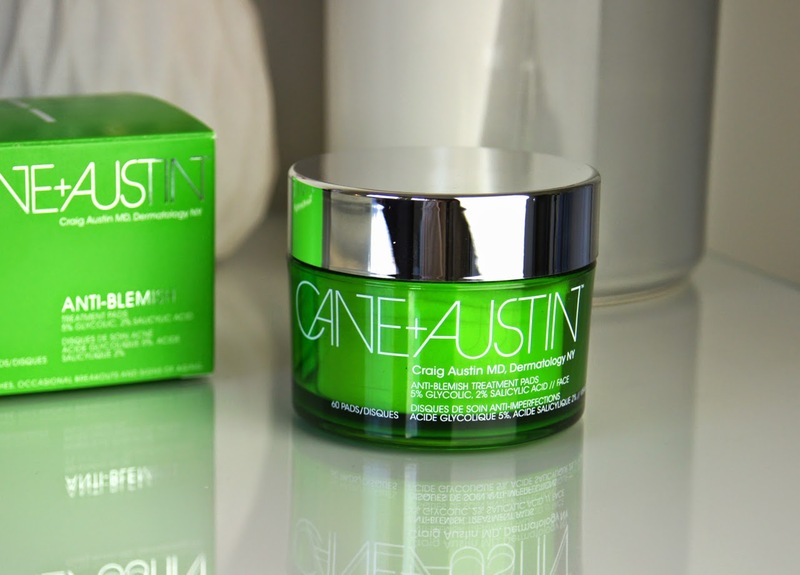 Rather than my usual toner and serum, I wipe one of these pads from Cane + Austin over my face, concentrating especially on blemish prone areas, after cleansing. Then, as usual, follow with a moisturiser and eye cream. Containing both AHAs and BHAs (Glycolic and Salicylic acid), the pads gently, but chemically exfoliate the skin and deep clean the pores, effectively combatting break outs from all angles. The pads themselves are so thin (make sure you don't pick up a couple at once), but smooth and feel really gentle on the face. They are so saturated with the anti-blemish elixir and don't become too dry as you use them, giving you more than enough solution for the entire face. The pad form is so convenient and quick to use, which is perfect for those busy mornings when you need to slap your skincare on quickly. 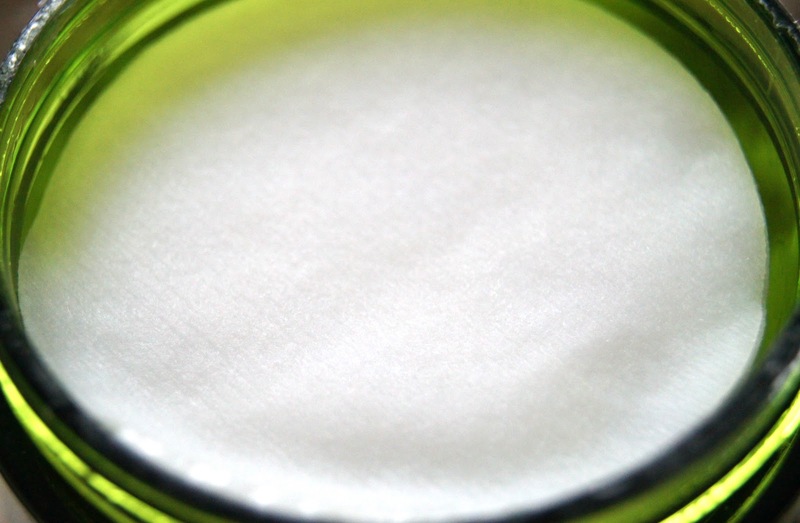 After use, my skin feels refreshed, soothed and not at all stripped. There's no stinging at all from my experience, but I could imagine fresh, broken blemishes could feel the effects slightly more. Absorbing into the skin quickly, the solution doesn't leave behind any residue, just a very clean feeling. A lot of blemish treatments make my skin dry and flakey, particularly in the winter months, but I haven't found that to be a problem with these pads and my makeup isn't affected at all by the formula. Packaging wise, the glossy green tub with the silver lid looks gorgeous on my dressing table and really stands out; it just looks so high end and chic for a skincare product. But, whilst they are great for at home, the large tub isn't ideal for travelling. Frustratingly, you can't take the pads out of the original packaging, as they would lose all that wonderful solution, dry up and be rendered ineffective. But, if they become a staple in your skincare routine, like they have for me, I'm sure you would be able to find room for them in your case somewhere. As I'm sure you can imagine, the biggest downside to these pads is that they're pretty expensive, at £48 for 60 pads. This may put people off significantly, but they have really helped my skin to fight both existing and future blemishes. If you're still tempted to try them, but want to get more for your money, then one of my friends cuts each pad in half to make them last longer. Personally, I haven't tried that technique, but I may well follow suit when I inevitably make a repurchase. Which skin treatments do you use to combat blemishes and break outs?